Thinly sliced sweet potatoes tossed in thyme and olive oil before being stacked and roasted make for a diabetes friendly, low cost, high fiber side dish. Dunk them into the garlicky yogurt dip and you’re all ready to go! In a large mixing bowl, mix together sweet potato slices, olive oil, thyme, 1/2 teaspoon salt and 1/2 teaspoon black pepper. Make sure each sweet potato slice is coated well with the spices and oil. In a 12-cupcake tin, stack enough sweet potato slices in each muffin cup to fill each of the muffin cups. 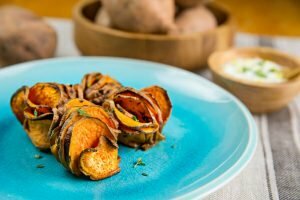 Bake sweet potato stacks in a 425°F oven for 45 minutes until potatoes are crispy, but well cooked. Rotate the pan halfway through cooking to ensure even baking. While the sweet potatoes are baking, mix together the Greek yogurt, parsley, lemon juice and zest and minced garlic. Season with salt and black pepper to your liking. 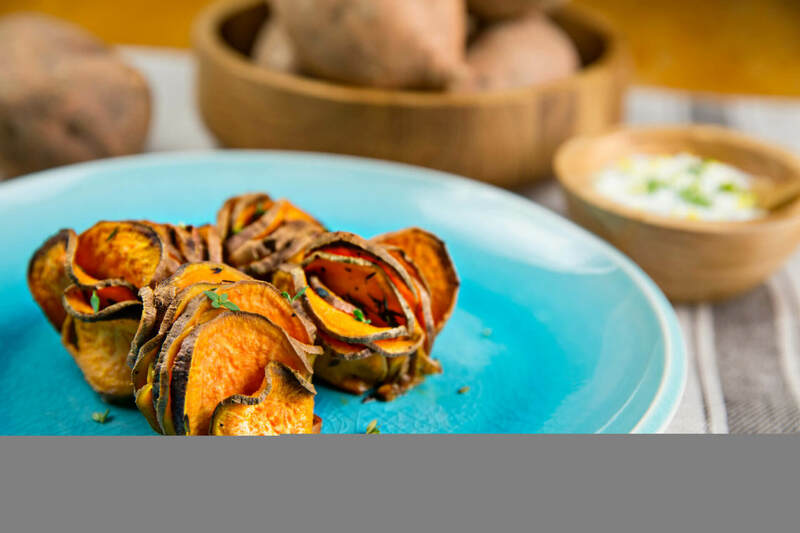 Serve each warm roasted sweet potato stacker with a dollop of the herb yogurt sauce. You can substitute 1 teaspoon of dried thyme for the 1 tablespoon of fresh thyme. You can substitute 1/2 teaspoon of granulated garlic for the 2 fresh garlic cloves. You can use whole fat, 2% or nonfat Greek yogurt. You can easily make this dish vegan by opting for a plant-based plain yogurt.